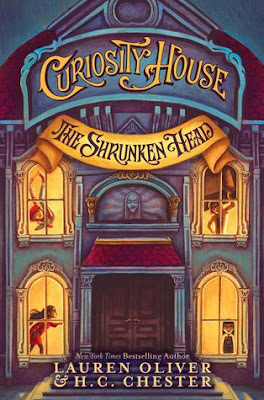 Blessed with extraordinary abilities, orphans Philippa, Sam, and Thomas have grown up happily in Dumfrey's Dime Museum of Freaks, Oddities, and Wonders. Philippa is a powerful mentalist, Sam is the world's strongest boy, and Thomas can squeeze himself into a space no bigger than a bread box. The children live happily with museum owner Mr. Dumfrey, alongside other misfits. But when a fourth child, Max, a knife-thrower, joins the group, it sets off an unforgettable chain of events. Since reading Oliver's Delirium I've gladly collected all of her other novels so when I heard she was writing another middle grade one I was pretty excited because I really enjoyed her previous two. This on in particular piqued my interest because I find life's little oddities completely fascinating so a novel set in a museum of them sounds right up my alley. Despite being set in the 1930's, which is usually something I'm not overly fond of, I almost didn't seem to notice in this book, and thus didn't mind in the least. Aside from the prices of things and the fact that no one is constantly glued to their cellphone it honestly seemed like the story could be taking place right now, and somehow that seeming ability to fit into both then and now worked quite well for this story. The four main characters, Pippa, Sam, Max, and Thomas, all had POVs in the novel, and with an equal split of boys and girls (Max is short for Maxine) this novel can easily be enjoyed by both genders without kids worrying about that they'll be made fun of for reading a book targeted towards the opposite gender. Each character had different talents and different strengths and weaknesses so it was really fun seeing inside all four of their heads when they were so completely opposite of each other. The novel, being a middle grade, included some illustrations spattered throughout the book, along with little ones at the start of each chapter to denote whose POV it was from. The whole-page illustrations weren't necessarilly essential to the story, just being drawings of various characters, but it was fun to look at them regardless because sometimes it's nice to see how someone else views the characters to help you see them better. I think it's also important to note that while people outside of the museum see the kids and other human "attractions" as freaks that's not how the characters see themselves. This message is continually repeated throughout the novel and I think it's something that's really important, because regardless of how the outside world may see them those who find a home in the museum are accepted there and find a family, enforcing the idea that no matter who you are you are never alone. Honestly there was nothing about this book that I didn't enjoy. The writing itself was absolutely spectacular despite the plot mainly revolving around several murders and a missing mummified shrunken head. It didn't seem like it belonged in a middle grade novel with a creepy setting because it was just SO pretty. There's a mystery element in the book related to the shrunken head and the murders I mentioned above and while I did figure it all out (well, all but one piece) before the big reveal I don't really mind just because the novel is intended for a slightly younger audience, meaning they too should be able to connect the dots. [Please note I'm not saying that middle grade readers are by any means stupid because I know they are not, but I do believe there is a curve in terms of difficulty for such things just to make sure most kids of the targeted age are able to figure it out should they take note of various things.] I was a little surprised by the possible dark connotations of one of the plot points, but seeing as it wasn't explored in detail by any means it's not something of the utmost importance, at least right now. *This book contains some possibly disturbing "images" what with descriptions of strange artifacts from around the world, and there are deaths that occur throughout the book. Although none are committed on the page there are mentions of bodies and some blood along with some mild scenes of suspense.